If you sign up for 24-months – yes, mobile contracts are stretching beyond the previously-accepted 18-months – and pay £35/month, they’ll give you the Storm handset for free. 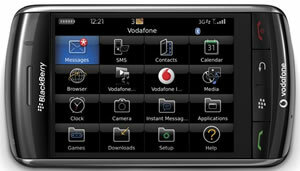 18-month contracts starting from £35/month will also get a gratis handset. Want to pay for your handset(!)? – there’s two prices available to you – £300 or at the upper end, £500, on a 12 month contract. All of the various packages are pretty darn complex, so you’d be better off checking them out yourself. The long contracts come with ‘unlimited’ Mobile Internet (with a ‘fair use’ limit of 3Gb/month), but surprisingly the low end deals don’t, potentially costing a _fortune_ to use the phone’s full potential. We’re on the list to get a Storm and are interested to try it out. We loved the Blackberry Curve long term, so how they’ve implemented the Storm’s touch screen will be key for us.